The dog days of Summer may not have officially started, but in many places, it’s already sweltering. To survive the hot, hot days, I need to be well equipped. Besides staying hydrated and wearing lighter clothing, I need a lot of sunscreen and some comfy, stylish sandals. I need my Vitamin D fix as much as anyone else, but anything beyond 10 minutes in the sun and I’m on my way towards lobster territory. Sunscreen is a must all year long, but especially in the summer. For me, this means covering every single part of my exposed skin. In other words, I apply sunscreen from head to toe. You might think applying sunscreen to your feet is silly unless you’ve been sunburned there. Besides, no one wants to be stuck with tan or burnt sandal imprints all summer. This is precisely why I’m always on the hunt for new and better sunscreens. In the past few years, this means using sunscreens offering more than broad spectrum protection, like Lavanila The Healthy Sunscreen Sport Luxe SPF 30. I was excited to give this Healthy Sunscreen a try. The Lavanila The Healthy Sunscreen Sport Luxe SPF 30 is 100% natural, cruelty-free, vegan, as well as free of parabens and aluminum. Infused with SmartSport Technology and antioxidants, this mineral sunscreen is designed to be water, the sun, and sweat resistant. What I like most about this sunscreen, besides it being all natural, is isn’t doesn’t have that sunscreen smell. I also liked the skin tone color, which helps to blur imperfections. Unfortunately, I don’t like the texture of the product. It’s very thick and doesn’t blend into the skin easily. It’s also very tacky. 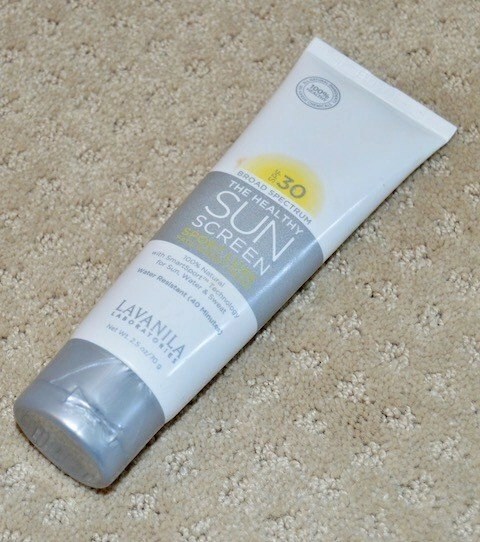 The Lavanila The Healthy Sunscreen Sport Luxe SPF 30 never fully absorbed into my skin, which left me feeling very sticky. This tackiness also caused lint and other debris to stick to my legs and arms. Once I’ve found the perfect sunscreen and applied it, I’m ready to head outdoors. As a shoe queen, I have summer shoes in all shapes, colors, and heel heights. As much as I love a good platform, my go-to summer shoe is a flip-flop or thong sandal. It’s the perfect shoe for running errands, heading to the beach or the pool. My latest favorite comes from Soft Comfort in the style Honeymoon Trail. This faux leather thong sandal, available in red, turquoise, and white features a cushioned insole and 1 ¾ inch heel. I opted for the red, which to me is more of a salmon color. I love how comfy the cushioned insole and rubber thong bumper makes these sandals. I wore them recently on an all-day errand fest and my feet felt amazing. Usually, after a long day, my feet and legs can feel achy and tired. Or they have blisters from a strap(s). This is especially true in the summer when I opt for style over comfort. With the Soft Comfort Honeymoon Trail, I get both. The only issue I have with the sandals is that the straps are a bit wide on my slightly narrow feet. This doesn’t impede with wear, but it is something to keep in mind if your feet on are on the narrower side. Regardless, I know I’ll be getting a lot of use out of these sandals this summer if I don’t melt from the heat and humidity first. What’s your go-to sunscreen? How do you embrace summer in comfort & style? Those flip flops look so comfy! I love the color of the ones you have, too! I totally think I need to get a pair. Super cute shoes! I just bought new salads for summer and it’s always good to have a comfy pair! Burnt feet are never fun, sunscreen is a must for me! Living in Florida, we wear flip flops year round! haha. I love my Teva flip flops so so much!! The best sunscreen that I’ve found is Neutrogena; any of it. I’ve never been burned when wearing it, when I have reapplied. It’s some great stuff! I love those sandals sort of throwback but so comfy looking. It is so refreshing to get the real lowdown on products and sunscreen. I saw these on Pinterest and could never find those sandals! So glad to find them here! The color of those shoes is my fave. Plus its so Summery. A great pic. I love those flip flops. I’m guilty of wearing the one dollar ones you can buy at walmart. They fall apart easily and are horrible for me feet and back. I should really buy a nicer pair like the ones you’ve showed us here. Those sandals are so cute. Love the color and how comfy they look. You can never have too many comfy, stylish shoes in summer. Those flip flops look super comfortable. I need a pair like this! Perfect summer essentials! Sunscreen is very important, as is comfort and those flip flops look comfortable! I would just need to get a pedicure done haha, I’ve been neglecting my nails! I need a pair of those sandals! I have been looking for a good pair for the summer and Soft Comfort looks like the way to go. the cool of these sandals are gorgeous! LOVE LOVE. I also think its the perfect way to enjoy the summer months since they look so comfortable. Those sandals look amazing! I have been wearing my moms old dr scholls for years and it may be time for n upgrade! 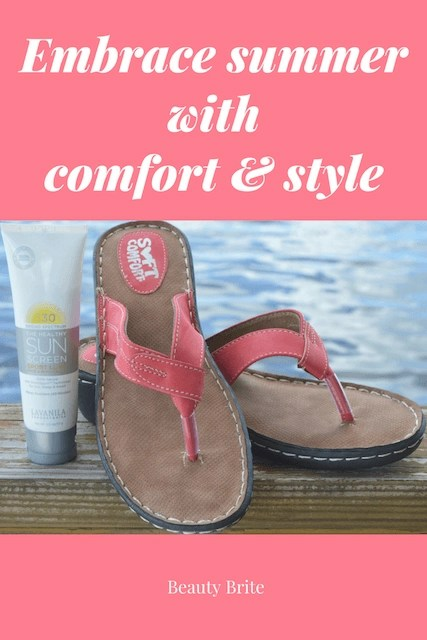 Some great products and those flipflops look comfortable and I’m needing new ones! These are some neat sandals. I really like the color. Also I use sunscreen all year round not only for summer months. These look perfect for summer! We have a backyard pool and the ground is so hot, I need a good pair of flip flops for all the time we’ve spending outside! These are such a lovely colour. I love being able to wear sandals in summer. It makes such a nice change from stomping around in boots all day!